Greenland melt of 2013 year has had fits and starts. It’s been dipping in and out of abnormal warmth and cold. The drama began with very low pre-melt albedo March to -mid-April due to a snow drought that made high melt in 2013 seem more than likely. Then, an about face, a lot of snow and relatively cold weather washed over Greenland for the next 6 weeks (20 April – early June)! Melt then came on strong 3 June yet was punctuated 22 June by a return of cold weather that has remained in place and is forecast through at least 8 July. It now seems more than likely 2013 won’t hit 2012 melt record, this after 6 summers in a row of negative North Atlantic Oscillation that favored Greenland heating. The persistence of that pattern had me wondering if, for example, the drop in Arctic sea ice or the complete ablation of snow cover on land had ~permanently altered large scale atmospheric circulation. Yet, what we see with 2013 suggests a more complex situation with extreme fluctuations of warm and cold. Surface reflectivity of sunlight is called “albedo”. Albedo is a Latin-based word referring to whiteness. The higher the albedo, the more sunlight can be reflected. As albedo decreases, more sunlight can be absorbed. The absorption of sunlight is the largest single source of melt energy on the Greenland ice sheet. Surface albedo across Greenland is mapped using data from NASA’s Moderate Resolution Imaging Spectroradiometer (MODIS) satellite-borne sensors. Before melting is underway, albedo is above 80%. The NASA albedo data have an accuracy better than 5% (Stroeve et al. 2006; Box et al. 2012). During melting, the rounding of ice crystals by heating causes the albedo to drop. A freshly fallen snow crystal has numerous facets to reflect sunlight (left). Warming causes the grains to round at the edges and clump together (right). Scanning electron microscope photos courtesy the Electron and Confocal Microscopy Laboratory, USDA Agricultural Research Service. In some areas of the ice sheet, by the time winter snow cover melt away, bare glacier ice is exposed. Where impurities congregate, the surface albedo drops below 30%. Impurities are composed of dust, algae, wildfire soot. Their relative importance to surface albedo remains incompletely understood. As part of Dark Snow Project’s 2013 expedition, Dr. Marek Stibal gathers samples from an area of concentration near the darkest point on the Western Greenland ice sheet. An increase in atmospheric heating of Greenland ice is a driver of Greenland ice albedo decline in summer, in part due to the expansion of bare ice areas, in part due to the heating effect on rounding ice crystals, and in part if the concentration of impurities increases. In the period of high quality observations beginning early 2000, June 2013 albedo for the ice sheet is ranked 3rd lowest. Greenland albedo started out very low in 2013 due to a snow drought exposing darker bare ice around the ice sheet periphery. The albedo feedback with climate is responsible for doubling the temperature changes when climate warms or cools. This amplifier helps Earth’s climate system swing into and out of ice ages. The feedback is complex, including the effects of heating and light absorbing impurities, in a process that compounds through time. Light absorbing impurities like black carbon from wildfire and industrial sources acts like a multiplier of the albedo feedback. The Dark Snow Project aims to better understand the black carbon aspect of the albedo feedback through field data gathering and laboratory analysis. Click here to visit the Dark Snow Youtube Channel. Stroeve, J.C., Box, J.E., Haran, T., 2006: Evaluation of the MODIS (MOD10A1) daily snow albedo product over the Greenland ice sheet, Remote Sensing of Environment, 105(2), 155-171. I’d reported on a highly abnormal snow drought that with more bare ground produced large negative albedo anomalies along west Greenland (Fig. 1). Figure 1. Greenland reflectivity below 500 m elevation, including land areas. Notice the extreme low anomaly for 2013 that is by now erased. Well, after about 4 months (1 Jun – 20 April) of that type of anomaly, the pendulum swung back late April, 2013, delivering a ~5 week return of snow showers that brought up to 300% of the normal snow for that period (Fig. 2) and relative cool weather (Fig. 3). Figure 2. End of snow drought. Blue and purple areas indicate abnormally high precipitation. The snow drought is not actually ended everywhere. Along northeast Greenland, snow accumulation remains well below normal, 20% of normal for 1-Jan – 25 May. A @Promice_GL field workers had to transport from Zackenberg station to AP Oleson ice cap using a Argo track vehicle instead of snowmobiles. Figure 3. 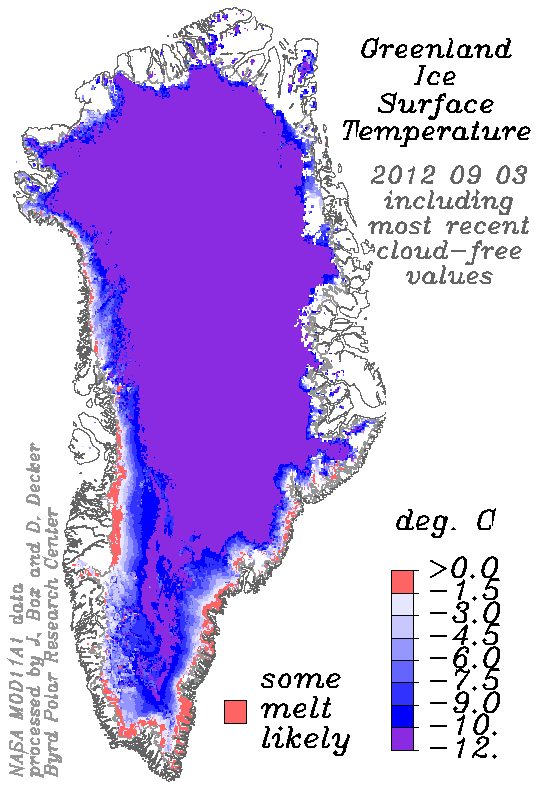 Persistent cold for Greenland between 24 April and 19 May. With the exception of melting 21-25 May, cold has been in place since 24 April. It’s clear now from the forecast for early June 2013 that temperatures will remain below freezing along much of west Greenland. It’s not extremely cold, just not yet melting much. It took 7 years to pull together a full ice sheet mass budget closure based on a fusion of observationally-based records from coastal and inland weather station temperature readings; ice cores; and regional climate modeling. Below are links to pre-prints. The papers’ abstracts capture key results but are constrained by 250 word limits. I emphasize part III below. Parts I and II were foundational works with interesting aspects. Part III brings in necessary data from parts I and II. Paper III puts forth a theory* linking surface melting with ice flow dynamics. The two are by now too often examined in isolation. Our not so old science of glaciology, beginning in earnest in the late 1950s, can now begin unifying surface and ice dynamics processes at the ice sheet scale. In stark contrast to the messaging that the recent Nick et al modeling study produced, we may expect plenty more sea level contribution from Greenland than current models predict. The misreporting of otherwise good science refers to ice flow to the sea as “melt”. Ice deformational flow is a distinct process from melt. Yet, melt and ice deformational flow are in fact intertwined processes. Self-reinforcing amplifying feedbacks outnumbering damping feedbacks by a large margin (Cuffey and Patterson, 2010, chapter 14) ensure that given a climate warming perturbation, a.k.a. the Hockey Stick, we’ll see a stronger reponse of ice to climate than is currently encoded by models. More on that later. Because the peak statistical sensitivity between meltwater runoff and ice flow discharge emerges at the decade scale (11-13 years), it seems that the ice softening due to more meltwater in-flow to the ice sheet, the Phillips Effect, if you will, is a central physical process behind a link between runoff and ice flow dynamics (Phillips et al. 2010; 2013). Yet, on shorter time scales and resulting from a rising trend of surface melting, also to be considered is the effect of meltwater ejection at the underwater front of marine-terminating glaciers. The effect is to force a heat exchange between the glacier front and relatively warm sea water with the ice (Motyka et al. 2003), melting it. This is, if you will, the Motyka Effect. Underwater melting undercuts the glacier front, promoting ice berg calving and thus providing a direct and immediate link between surface runoff and ice flow. Calving reduces flow resistance, causing ice flow acceleration. January-February 2013, As I responded to 3 critical anonymous external reviewers and the sands of time were running low to make the 15 March, 2013 deadline for the IPCC AR5, in a bid to increase the likelihood of paper III’s acceptance, I brought on Liam Colgan. His fresh and sharp eyes would comb out any potential text and methodological snags from my major revision. While you may know Liam to be a frequent user of Monte Carlo methods, I already had that in this paper before thinking of his involvement. To his credit, Liam contributed the crevasse-widening aspect to the theory that builds coincidentally via Colgan et al. (2011)’s building on Pfeffer and Bretherton (1987). The Colgan Effect is thus the 3rd aspect of the unified theory this part III study puts forth. As to the result of the mass budget reconstruction, it’s not surprising that Greenland ice sheet contribution to sea level has accelerated. After all, climate has emerged from the dim-sun Little Ice Age into the greenhouse gas-forced new post-industrial climate epoch, the Anthropocene. Greenland’s going. It’s a question of how fast. I’m happy to report that more to this story is in the works. So, stay tuned. * A theory is a broad collection of knowledge based on hypotheses (emphasis plural) that have withstood skeptical inquiry and are accepted, unless otherwise proven, as Fact. J. Climate Editor Anthony J Broccoli deserves thanks for, presumably, working extra in recognition of critical timeline. Cuffey, K.M. and W.S.B. Paterson (2010). The Physics of Glaciers, Fourth Edition. Elsevier, 693 pp. Motyka, R. J., L. Hunter, K. A. Echelmeyer, and C. Conner, 2003: Submarine melting at the terminus of a temperate tidewater glacier, LeConte Glacier, Alaska, U.S.A. Ann. Glaciol., 36, 57-65. Pfeffer, W. and C. Bretherton, 1987: The effect of crevasses on the solar heating of a glacier surface, IAHS Publication, 170, 191-205. Phillips, T., H. Rajaram, and K. Steffen, 2010: Cryohydrologic warming: A potential mechanism for rapid thermal response of ice sheets, Geophys. Res. Lett., 37, L20503, doi:10.1029/2010GL044397. Phillips, T., W. Colgan, H. Rajaram and K. Steffen. Evaluation of cryo-hydrologic warming as an explanation for increased ice velocities near the equilibrium line, Southwest Greenland. J. Geophys. Res. ,2012JF002584, submitted 7 July 2012, revised 31 December 2012. A friend in Greenland’s capital Nuuk reported (with a frown) that the backcountry skiing this year was poor due to a “snow drought”. Figure 1. Western ice sheet snowfall totals are 30%-70% of normal. Brown areas have less than ‘normal’ precipitation. Blue/purple areas are anomalously ‘wet’. The precipitation anomalies are calculated from ‘re-analyses’ data after Kalnay et al. (1996). Less snow leads to a smaller refreezing capacity in the lower accumulation area. Thanks Robert Fausto of GEUS for reminding me of this one. a possible higher concentration of light absorbing impurities per unit volume of snow, assuming that the impurities are deposited whether or not it snows. This pattern results from a persistent atmospheric anomaly, blocking cold air transport southward along west Greenland, producing relatively warm temperatures there while northwestern Europe has had a cold winter (Figure 2). Figure 2. The data after Kalnay et al. (1996) indicate tendencies toward offshore flow over western Greenland, opposite for what is needed to produce normal snowfall. The precipitation anomaly is manifesting in abnormally low land and ice sheet reflectivity (albedo) (Figure 3). Figure 3. April 2013 surface albedo (a.k.a. reflectivity) anomaly. Substantially lower albedo anomalies on land are due to the dearth of snow revealing a much darker underlying tundra. The red areas across the northern 1/3 of Greenland are uncertain due to low solar illumination angles. Low snowfall anomalies precondition Greenland ice for enhanced melt (Mote, 2003; Box et al. 2005; 2012), especially for the western ice sheet where the snowfall amounts are less than over the east. From 20 March – 20 April, the snow drought drove ice sheet reflectivity well below values in 13 years of (NASA MODIS sensor) satellite observations since 2000 (Figure 4). Negative North Atlantic Oscillation (NAO) has promoted Greenland heating, melting and snow drought for now 6 summers in a row (Tedesco et al. 2013; Fettweis et al. 2013). Negative late winter NAO packs a similar punch. Negative NAO has prevailed much of the past decade and is largely to blame for Greenland’s astonishing melt increase. Whether negative NAO is promoted by an earlier loss of snow on land and declining Arctic sea ice area is something I’ve been wondering about. Figure 4. 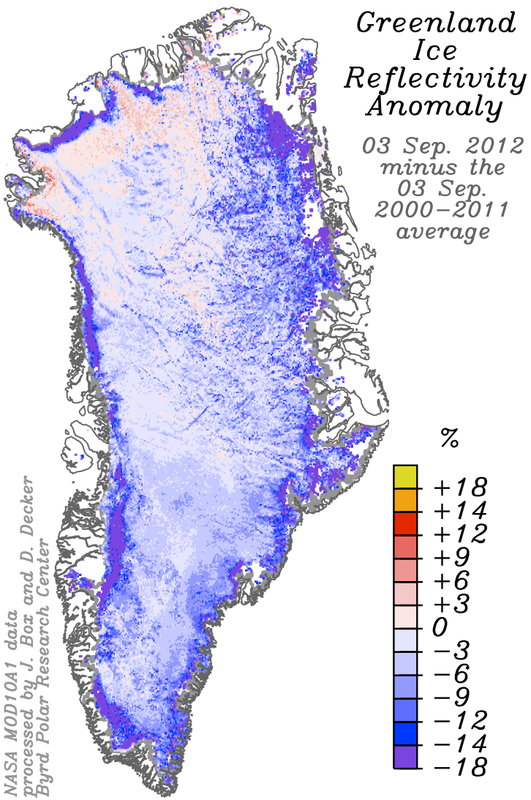 Greenland ice sheet (land excluded) reflectivity or albedo updated after Box et al. (2012). Then the weather flipped and ice sheet reflectivity rebounded toward normal values in the latest 10 days (Figure 4). Ice sheet reflectivity and accumulated precipitation remains lower than average for the year to date through 1 May (not shown), it therefore remains more likely than not that we’ll see a big melt in 2013. Fausto, Robert, provided point 3 above. Fettweis, X., Hanna, E., Lang, C., Belleflamme, A., Erpicum, M., and Gallée, H.: Brief communication “Important role of the mid-tropospheric atmospheric circulation in the recent surface melt increase over the Greenland ice sheet”, The Cryosphere, 7, 241-248, doi:10.5194/tc-7-241-2013, 2013. The data are constrained by measurements from weather stations, weather balloons, ships, aircraft, and satellites. I total precipitation for 1 January – 30 April, 20130 and difference these with the average total for the same interval over each year in the most recent 30-year ‘climate normal’ spanning 1981-2010. Earth Day Sunday 21 April temperatures were not high (max 57 F, 14 C) despite full sun all day. I was down to a T-shirt for 1/10th the day. While we were not permitted to use black carbon, the erosion of the ice sculpture by the sunlight and dark grey chalk we were sprinkling on it exceeded my expectations. We were working the crowd, having one-on-one (or two) conversations and getting $5-$20 pledges from half of the folk, entirely within reason. It was interesting to see some folks’ interest change to vacancy once the description turned to an ask for $. It was exhausting giving the “elevator pitch” over and over and over. It was hard to not let rejection get to you, especially as the day wore on and the fatigue grew. My favorite pseudo-rejection experience was pitching to three very wealthy looking foreigners, really nice clothing, accessories; they listened with apparent interest and when I asked for $ support, they nodded… I got five dollars. What did not happen and I cannot be surprised is some wealthy person pledging $1000 or so. We had I think two $100 donations another two $50 pledges but I think these were from friends. What I learned from this was it’s hard work getting donations using the “elevator pitch” on the street to innocent bystanders. Who likes getting asked for money by a stranger? For the day, we netted ~$1200, in line with my expectations. The mGive text donation may add up to more but I doubt another $1200. We spent far more on the installation and yet more of the investment was time. I’m not discouraged because I would not be surprised that the visibility from this event evolves into more support as time goes on. I guess at least 5000 people stopped and looked at the sculpture. Many of them took photos and I hope that they shared those with their social network. Thus, the Dark Snow Brand gains traction. I think we had no doubt the most interesting installation at the Earth Day event, also what people told us. The green car show next to us was a formidable competitor. Posted in Dark Snow Project, ice sheet melt factor | Comments Off on Have an ice Earth Day! While ice sheet average temperatures are declining with the return of the cold season this September, ice sheet reflectivity (a.k.a. albedo) remains anomalously low (Fig. 1). The low albedo values reflect (pun alert) where snow accumulation has not yet covered the darkened surface. There remain some areas where melting remains active at the lowest elevations of the ice sheet (Fig. 2). Melt promotes or maintains low ice reflectivity. Available sunlight in 2012 thus continues to heat the ice and snowpack more than it has in the period of observations beginning in 2000. Less heat will be required to maintain melting or bring the ice to the melting point in the future. It is easy to predict early melt onset in 2013 and a continuation of increasing ice sheet melt rates that contribute to the recently observed net ice loss from Greenland. Fig. 2. Land surface temperature retrieval from the NASA MODIS sensor on the Terra satellite. You are currently browsing the archives for the ice sheet melt factor category.